Trevor Paglen is an artist whose work spans image-making, sculpture, investigative journalism, writing, engineering, and numerous other disciplines. Among his chief concerns are learning how to see the historical moment we live in and developing the means to imagine alternative futures. Paglen’s work has had one-person exhibitions at Vienna Secession, Eli & Edythe Broad Art Museum, Van Abbe Museum, Frankfurter Kunstverein, and Protocinema Istanbul, and participated in group exhibitions the Metropolitan Museum of Art, the San Francisco Museum of Modern Art, the Tate Modern, and numerous other venues. He has launched an artwork into distant orbit around Earth in collaboration with Creative Time and MIT, contributed research and cinematography to the Academy Award-winning film Citizenfour, and created a radioactive public sculpture for the exclusion zone in Fukushima, Japan. The Cantor Center for Visual Arts at Stanford University came to OBSCURA DIGITAL and proposed a collaboration with artist Trevor Paglen, whose work addresses topics like government secrecy and surveillance, exposing the vast apparatus of machines, systems and algorithms that monitor virtually every aspect of our lives. 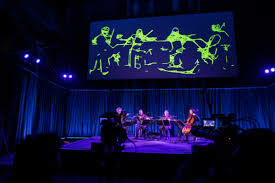 Paglen’s “Sight Machine”project would demonstrate to a live audience how machines “see” the world — in this case, a performance by the renowned Kronos Quartet. 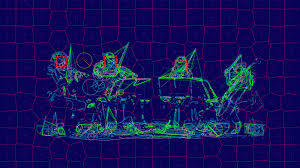 Obscura digital worked with Paglen’s team to develop the computer and video systems to take a live video feed of the string quartet’s performance, run it through actual off-the-shelf artificial intelligence surveillance algorithms (over a dozen of them in total), and project what the AIs see and how they interpret it onto a screen above the musicians. These AIs — whether for facial recognition, object identification or threat detection — are designed to communicate with their machine counterparts, not to provide human-readable output. Making that possible in realtime required Obscura’s systems engineers to maximize throughput in a Herculean research and development effort.